As I reported in an earlier post, two weeks ago seven physicists announced the observation of a new light boson of mass 38 MeV at the Nuclotron particle accelerator in Dubna, near Moscow. The new boson, named the E(38), is not predicted by the Standard Model of the strong and electroweak interactions, and if the observation is confirmed, it will be the first discovery of an elementary particle not predicted by the Standard Model, since the Standard Model became established in the 1970's. The evidence for the E(38) boson was a small excess above background, peaked at about 38 MeV, in the distributions of the invariant mass of photon pairs produced in three different processes, involving the scattering of beams of deuterons or protons aimed at carbon or copper targets. For example in Figure 2(a) of the article arXiv:1208.3829 announcing the observation of the E(38) boson, which I am reproducing here with permission, the green histogram in the top panel is the Standard Model background, and the small red excess above the background, which is largest at about 38 MeV, is attributed to pairs of photons from the decay of the E(38) boson. The lower panel shows the excess after subtraction of the Standard Model background. The statistical significance of the excess above background centred at about 38 MeV is about 5 sigma, which is the usual standard for discovery of a new particle in high energy physics. As Tommaso has pointed out, the announcement article arXiv:1208.3829 does not give any details of how the background distribution of the photon pair invariant mass was determined. Since the background is about 14 times larger than the claimed signal at the peak of the signal for the measurements shown in Figure 2(a), and is at least 6 times larger than the claimed signal at the peak of the signal for all the measurements shown in arXiv:1208.3829, Tommaso is understandably sceptical about whether the signal is really there. However the authors refer to another paper for a description of the experimental equipment, and the details in this reference appear to address most of the points raised by Tommaso. To explain in more detail how the Dubna group observed a signal for the candidate E(38) boson, and how they measured the background, it is convenient to use units of measurement such that the speed of light is equal to 1, so that if, for example, distance is measured in metres, then time is measured not in seconds but in units of nanosec. Then the units of energy, momentum and mass all become the same, so that Einstein's relation between the total energy of a particle that is not moving, and its mass , becomes . The total energy of a particle of mass moving at speed can now be written as , which for small compared to 1, so that the particle is moving slowly compared to the speed of light, is approximately equal to , which is the sum of its rest energy and its kinetic energy according to Newton's mechanics. The kinetic energy of a particle that is not necessarily moving slowly compared to the speed of light is defined to be . The sum of the total energies of all the particles involved in a collision process is always the same before and after the collision, even if new particles are produced or particles disappear during the collision. If the velocity vector of a particle is , where , then its momentum vector is , which for small compared to 1, is approximately , which is its momentum vector according to Newton's mechanics. The sum of the momentum vectors of all the particles involved in a collision is always the same before and after the collision. The difference between the square of a particle's total energy , and the square of its momentum vector , is always equal to the square of its mass , for all possible values of its speed . The speed of a massive particle is always less than 1, because its energy approaches infinity as its speed tends to 1.
where at the first step in the second line I used and , and at the second step in the second line, I used , where , which is the Greek letter theta, is the angle between the directions of motion of the two photons, and I explained the meaning of in another post, here. The expression is called the invariant mass of the two photons, and from the above formula, the invariant mass of two photons can be measured by measuring their energies and , and the angle between their directions of motion. Photons whose energy is about an MeV or more are often called gamma rays or rays, where the symbol is the Greek letter gamma, because that is what they were called when they were first observed about a century ago. So I shall represent the invariant mass of the two photons by . In the Dubna experiment, the candidate E(38) bosons are produced by a beam of deuterons or protons incident on a copper or carbon target in the JINR Nuclotron. The candidate E(38) bosons are detected if they are emitted towards one of the two arms of an electromagnetic lead glass calorimeter called the PHOTON-2. The left and right arms of the calorimeter are located 3 metres from the target, at angles to the left of the beam and to the right of the beam respectively. The kinetic energies of the deuterons were 6 GeV = 6000 MeV for the copper target and 4 GeV = 4000 MeV for the carbon target, and the kinetic energies of the protons were 4.64 GeV = 4640 MeV for the carbon target. These kinetic energies are much larger than the 38 MeV mass of the candidate E(38) boson, so if any E(38) bosons were produced, they would be unlikely to be produced approximately at rest. Instead they would most likely fly out of the collision with a kinetic energy somewhat smaller than the kinetic energy of the incident deuteron or proton, but nevertheless much larger than the 38 MeV mass of the E(38) boson. The sum of the energies of the two photons the E(38) boson decayed into would be equal to the total energy of the E(38) boson, so the energies of both these photons would usually also be much larger than the mass of the E(38) boson. From the above formula, the invariant mass of a photon of energy in the left arm of the calorimeter and a photon of energy in the right arm of the calorimeter would be approximately , since , so if and were both much larger than 38 MeV, this would be much larger than 38 MeV. The invariant mass of two photons can only be much smaller than the energies of the photons if the two photons are travelling in approximately the same direction, so to search for an excess above the expected background distribution of the invariant mass of pairs of photons for in the region of 38 MeV, the Dubna physicists measured the distribution of for pairs of photons in a single arm of the calorimeter, and in the article arXiv:1208.3829, they report the distributions observed in the right arm of the calorimeter. To determine whether or not the measured distribution of contains a signal from a candidate new particle decaying to pairs of photons, it is necessary to determine and subtract the background distribution of that results from the particles and interactions of the Standard Model. As Tommaso pointed out, the most important backgrounds are bremsstrahlung and the decay of neutral pions. These produce background distributions of of completely different character. Bremsstrahlung, which means "braking radiation," is a smooth random distribution of photons emitted with a wide range of energies smaller than the energies of the electrically charged particles involved in a process, that occurs whenever the speed or direction of motion of a charged particle changes. A classic result of quantum electrodynamics, discovered by Felix Bloch and Arnold Nordsieck in 1937, is that for bremsstrahlung photons whose energies are much smaller than the energies of the electrically charged particles involved in a process, the energies and directions of motion of the bremsstrahlung photons emitted randomly in any process are uncorrelated with each other. This means that the distribution of the energies and directions of motion of pairs of bremsstrahlung photons, and in particular, their invariant mass, can be approximately predicted, for fixed experimental conditions, from observations of the energies and directions of motion of single bremsstrahlung photons. The distribution of from the decay of neutral pions, , is completely different. The meson, whose mass is 134.98 MeV, is the lightest strongly-interacting particle that can be separated by distances of more than about from other strongly interacting particles. Its lifetime is , where 1 nm = 1 nanometre is , and it decays to two photons 98.8% of the time. Thus the intrinsic quantum-mechanical width of the meson, which is divided by its lifetime, where is Planck's constant divided by , is . So if the energy resolution and angular resolution of the calorimeter were perfect, so that the invariant mass of each photon pair was measured without any error, then the distribution of from the decay of mesons, on a plot of from 0 to 200 MeV, would look like a sharp spike at , and 0 elsewhere. For in degrees rather than radians, the last of these formulae becomes , since , and the other two formulae are unchanged. These formulae mean, for example, that if the measurement of is in error by an amount , where the symbol , which is the Greek letter Delta, is often used to denote a change to the value of the quantity that follows it, then the corresponding error in the measurement of will be approximately . The observed photon pairs with a given value of can have a range of different values of , , and , and for a representative example with , I'll take , and , which from pages 3 to 5 of arXiv:0806.2790 is approximately the angle between the paths of a photon that passes through the center of the right arm of the calorimeter, and a photon that passes through the edge of the front surface of the right arm of the calorimeter. Then from , we have . For this value of , the formula above for the energy resolution of the calorimeter gives , so . And for , from the angular resolution of the calorimeter, as above, we have . Thus for this example we have , so the measured distribution of is expected to show the spike at 134.98 MeV, from decay, spread out into a peak of half-width about , and this is in approximate agreement with the peak seen with a deuterium beam incident on a carbon target in Figure 8 of the article arXiv:1208.3829 announcing the observation of the E(38) boson, although a high bin in the corresponding measurement for a deuterium beam incident on a copper target, in Figure 9 on page 13 of the article, spreads the peak a little further in that case. These observations of the peak serve to calibrate the mass measurement. From pages 8 and 15 of arXiv:1208.3829, the Dubna group used a method called "event mixing" to measure the shape of the background distribution of . From the description on page 5 of arXiv:0806.2790, this means that each pair of background photons consists of two observed photons randomly selected from different events. From the result of Bloch and Nordsieck that I mentioned above, this would give the exact shape of the background distribution of if the background was purely bremsstrahlung, provided the photon energies were low enough, and the mean number of bremsstrahlung photons of sufficient energy to trigger the calorimeter was the same for all relevent motions of the electrically charged particles involved, because the Bloch-Nordsieck result, that the energies and directions of motion of the bremsstrahlung photons are uncorrelated with each other, becomes exact in the limit where the photon energies tend to 0, because the emission of a photon then has negligible effect on the energy and momentum of the charged particle that emitted it. In reality, the relevant photon energies are around 10% of the kinetic energies of the deuterons or protons in the beam incident on the target, so the Bloch-Nordsieck result applies approximately but not exactly. This means that the event mixing method of measuring the background introduces systematic errors due to the violation of the energy and momentum conservation laws, when the two-photon background is measured by randomly selecting pairs of single photons from different events. We would also expect systematic errors to be introduced due to contamination of the single photon bremsstrahlung background by photons from decay, unless the background is measured by randomly combining pairs of single photons from events that contain exactly one photon. This is not possible in practice, however, since the calorimeters only cover a small fraction of the solid angle around the interaction point. The paper arXiv:1208.3829 announcing the observation of the E(38) boson does not discuss this source of systematic error. 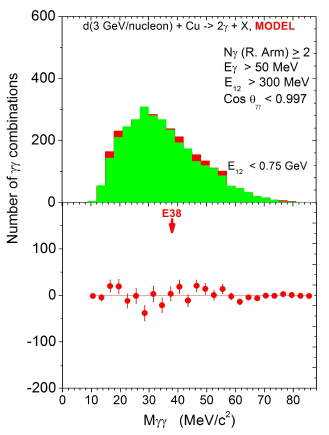 Figure 11 of the article arXiv:1208.3829 announcing the observation of the E(38) boson, which I am reproducing here with permission, shows the comparison of the event mixing background with the distribution of for about simulated events for the deuteron beam incident on the copper target. This provides evidence that the event mixing method adequately represents the two-photon background over the relevant range of from about 10 MeV to about 90 MeV, so that contamination of the background by photons from decay is not significant for this range of . Comparison with Figure 2(a) of the article, which I reproduced above, shows that the excess centred at about 38 MeV in the measured data is absent from the simulation based on the Standard Model shown in Figure 11. The cuts have to be applied in exactly the same way to the observed data and to the measured or modelled background. So for the event mixing method of measuring the background that the Dubna group used, each pair of background photons, which comprises two photons randomly selected from different events, is accepted or rejected according to the specified cuts on the energies of the photons and the angle between their directions of motion, exactly as if the two photons were from the same event. As Tommaso pointed out, the necessity of applying selection cuts to the data means there is a danger that physicists eager to discover a new particle might "tune the cuts", so as to create the appearance of a signal of a new particle, where in reality there is none. If the modelling of the background was perfect, and the number of events observed was sufficiently large that the impact of random statistical fluctuations was negligible, then this would be impossible. But for real experiments, it is necessary to guard against the problem of tuning the cuts. One method that is often used to avoid the danger of tuning the cuts is to analyse the data "blind": the physicists fix the choice of selection cuts, and measure or model the background, before they allow themselves to look at the actual measured data. However this method leaves open the possibility that the cuts might accidentally be tuned by chance, so that the cuts amplify the effect of a statistical fluctuation, which could lead the experiment to report an erroneous result. A more robust and informative way to avoid the danger of tuning the cuts is to investigate and report the effect of a range of different cuts. This is the approach used by the Dubna group in the paper arXiv:1208.3829 that announces the observation of the E(38) boson. They consider 4 different choices of cuts, which fall, however, into 2 pairs of similar choices, and for the deuteron beam on a copper target, where the kinetic energy of each deuteron is 6 GeV = 6000 MeV, they report the measurements for all 4 choices of the cuts. To get a rough understanding of the background distribution of that results from a particular choice of cuts, I'll consider their criteria (A), which are the criteria used for the measurements shown in Figure 2(a), which I reproduced above, and for the simulation shown in Figure 11, which I reproduced above. The cuts in this case are that the energies and of the two photons are required to be , where the symbol means "greater than"; the sum of the photon energies is required to satisfy , where the symbol means "less than"; and the angle between the directions of motion of the two photons is required to satisfy , which means that is required to be not less than about . Tommaso suggested that the purpose of the lower limit on might be to ensure that the two photons are in most cases found in different modules of the calorimeter. From the diagram on page 1 of the announcement paper arXiv:1208.3829, which also appears on page 4 of the paper arXiv:0806.2790 which describes the detector and the method of measuring the background, each of the two arms of the calorimeter consists of 16 hexagonal modules. From the table on page 5 of arXiv:0806.2790, the total area of the two arms of the detector is , so the area of one arm of the detector is . To get a rough understanding of the background distribution of , I'll approximate the right arm of the detector as a circle of this area. I'll denote the radius of that circle by , so from , we have , where the symbol means "approximately equal to". From page 3 of arXiv:0806.2790, the front surface of the calorimeter is 3 metres from the interaction point, so if one photon passes through the centre of the calorimeter and the other photon passes through a point on the edge of its front surface, then we have , so and , while if the two photons pass through opposite points on the edge of the front surface of the calorimeter, we have and . From above, the invariant mass of the two photons is . For fixed energies and of the photons, the largest possible value of is obtained when has its minimum value of about 0.970, so the largest possible value of is about , and the smallest possible value of is obtained when has the maximum value 0.997 allowed by the cut, so the smallest possible value of is about . This diagram shows the cuts on and for the criteria (A), with plotted in the horizontal direction and plotted in the vertical direction. The allowed values of lie within the trapezium-shaped region whose boundaries are the green straight line running from the top left corner to the bottom right corner of the diagram, which corresponds to , the green straight line parallel to that one, which corresponds to , the vertical blue straight line, which corresponds to , and the horizontal blue straight line, which corresponds to . The five curved lines are examples of lines on which the product has a constant value. The smallest value of attainable in the trapezium-shaped region of allowed values of corresponds to the black curve, , which intersects the allowed region at the points and . So the smallest possible value of for the cut criteria (A) is about , which is roughly in agreement with Figures 2(a) and 11, that I reproduced above and above. The largest attainable value of corresponds to the upper red curve, , so the largest possible value of for the cut criteria (A) is about , which is again roughly in agreement with Figures 2(a) and 11. As Tommaso pointed out, it is also important to understand the normalization of the background distribution, which is the overall scale factor applied to the background distribution once its shape is known. To address this requirement, the Dubna physicists used two different normalizations of the background distribution for each set of cut criteria. The first choice of background normalization, used in Figures 2(a), 3(a), 4(a), 5(a), 6(a), 7(a), and 10(a), set the total number of background photon pairs equal to the total number of observed photon pairs, which due to the excesses above background in the region of , resulted in the observed distribution of photon pairs falling below the background for some intervals of . The second choice of background normalization, used in Figures 2(b), 3(b), 4(b), 5(b), 6(b), 7(b), and 10(b), set the number of background photon pairs in a range of away from the excess around equal to the number of observed photon pairs in that range of . This method of fixing the background normalization in a "control region", away from the candidate "signal region", is often used in searches for new physics at the CERN Large Hadron Collider. The announcement paper arXiv:1208.3829 found evidence for the E(38) boson for all the processes, choices of cut criteria, and choices of background normalization for which it presented measured data. 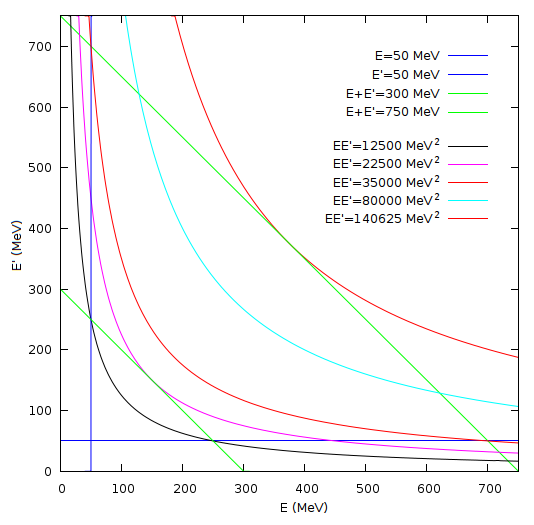 By using well-known properties of bremsstrahlung, I used the Dubna measurements to estimate the coupling constant of the up and down quarks to the E(38) boson candidate as roughly in order of magnitude, if the E(38) is produced in a bremsstrahlung-like manner and decays only to two photons. The details are here. For comparison, the coupling constants of electrons, up quarks, and down quarks to photons, in the same units, are about , , and respectively. The small magnitude of the coupling constant of the up and down quarks to the E(38), and the presumed equally small or smaller coupling constant of electrons to the E(38), would explain why the existence of the E(38) was not suspected until it was proposed last year by Eef van Beveren and George Rupp in arXiv:1102.1863. 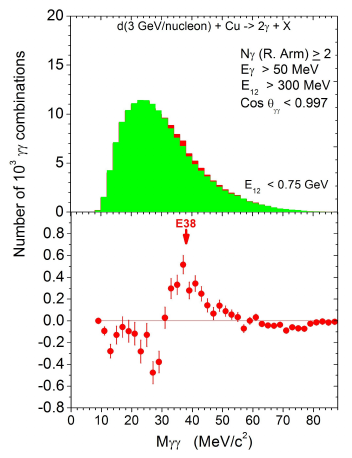 The coupling constant of the up and down quarks to the E(38) could be substantially larger in magnitude than if, for example, the E(38) decayed mainly to pairs of sufficiently light particles of dark matter, so that only a small fraction of the E(38)'s produced in the Dubna experiment decayed to pairs of photons. The up and down quarks are the main quark constituents of protons and neutrons: a proton consists of two up quarks plus a down quark plus an indeterminate number of quark-antiquark pairs and gluons, and a neutron consists of an up quark plus two down quarks plus an indeterminate number of quark-antiquark pairs and gluons. Quarks are similar to electrons, except for the fact that they can emit and absorb gluons. Gluons are similar to photons, except for the fact that they can themselves emit and absorb other gluons. The quarks and gluons interact so strongly with each other that an isolated quark or gluon can never be separated from other quarks or antiquarks and gluons by a distance of more than about 10-15 metres. Quarks and gluons can be indirectly "seen" in high energy physics experiments such as the ATLAS and CMS experiments at the Large Hadron Collider at CERN, because a near head-on collision between a quark, antiquark, or gluon in a proton going in one direction around the accelerator ring and a quark, antiquark, or gluon in a proton going in the other direction around the accelerator ring results in those quarks, antiquarks, or gluons flying out of the protons that contained them, in directions that can be up to 90° from the beam direction. As they fly out of the proton that contained them, these quarks, antiquarks, or gluons rapidly emit more quarks, antiquarks, and gluons, in a process similar to bremsstrahlung, and these emitted quarks, antiquarks, and gluons in turn emit more, so that a cascade of emitted quarks, antiquarks, and gluons builds up. The quarks, antiquarks, and gluons in such a cascade rapidly assemble themselves into particles such as pions, protons, and neutrons, which are seen in the detector as a "jet" of particles of this type, whose total energy and momentum match the energy and momentum of the quark, antiquark, or gluon that the jet originated from.